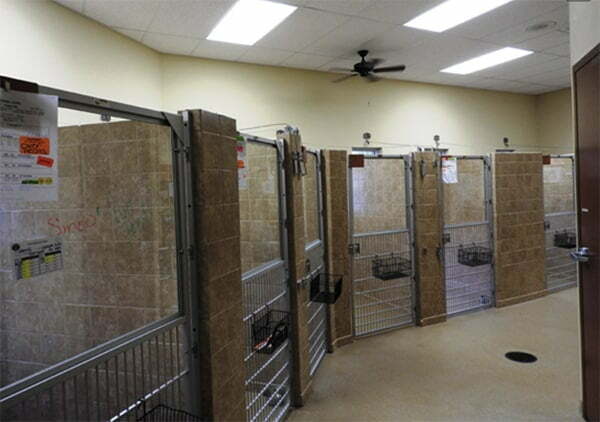 Country Inn Pet Resort offers 5 Star boarding accommodations, especially designed to provide comfort and that cozy home-away-from-home feeling. Decorated in a warm country style theme, the majority of our suites have access to a private, adjacent outdoor area. Windows allow natural light in and 7 feet high, tile walls guarantee privacy while soothing music surrounds them providing a stress free environment. After they comfortably rest in their private suites, each guest is taken out 4 times a day to exercise, play or just enjoy our 3 acres of outdoor areas at no extra charge. The Country Cottage is a large room much like one you probably have at your home. Tastefully decorated with a country theme, this suite has a custom bed, 2 large windows, a TV, and a large private outdoor area facing the pool and pawcuzzi. It is strategically located in an area where they will always see and hear what is going on around them. Recommended for dogs who enjoy high traffic surroundings. The Hunters Lodge is the largest Deluxe VIP Suite with a cute and appealing décor. It has a very large window facing the gardens at the front of the building. 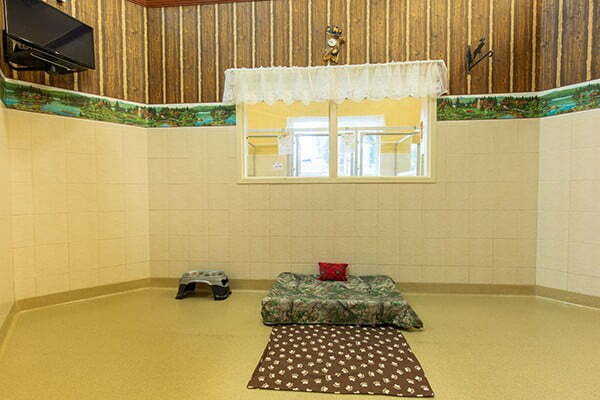 The Hunters Lodge is located in a quiet area near the kitty boarding section. 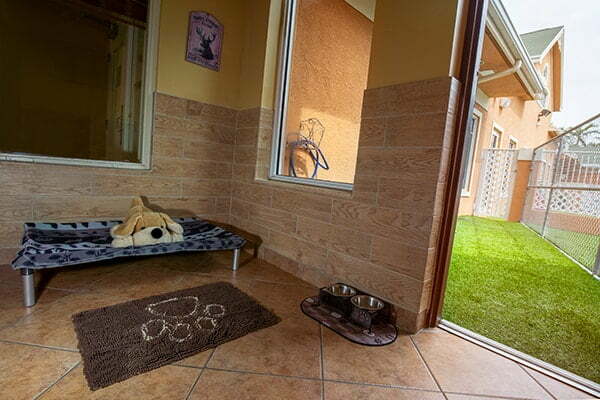 This suite is highly recommended for dogs who prefer a more private and tranquil environment. The Log Cabin is a cozy and spacious suite with tile walls and, log imitating wall decorations, which gives it that mountain log cabin feeling. 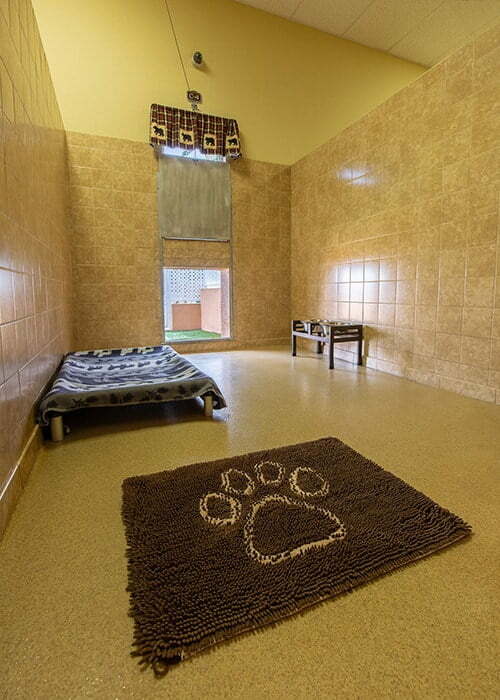 This very ample and comfortable cabin has various windows, a TV and is located in the small breed boarding section of the facility. The Cowboy Ranch is similar to the Log Cabin in size and comfort. Tastefully decorated with a Wild West cowboy theme, it too has its very own TV, various windows and a comfortable custom bed. 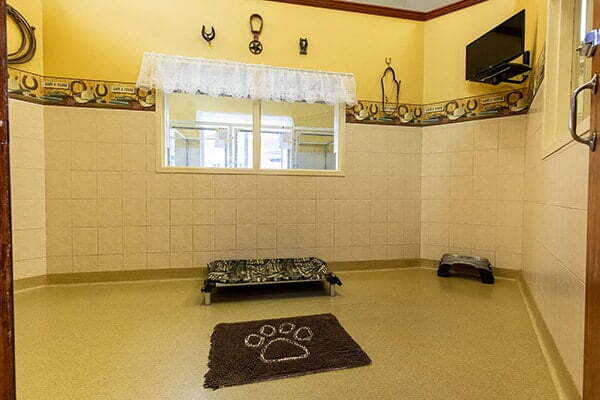 This cozy suite is also located in the small breed boarding section of the facility. The Colorado and Wyoming VIP Suites are ample and very comfortable suites measuring approximately 8 X 5 feet. Each suite has a window and a door that gives them access to an adjacent private outdoor area facing the large fields. The suites are separated by 7 feet tile walls, offering privacy and a stress free environment. Soothing music surrounds them at all times and they can enjoy their favorite programs on their TVs. 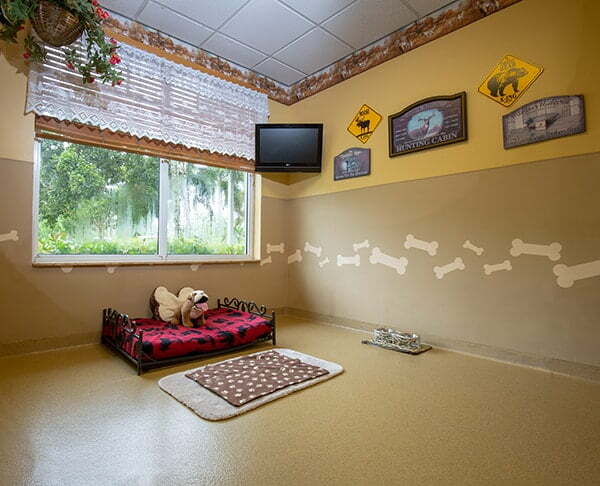 The Senior Citizen Canine Suites are perfect for our beloved senior guests. 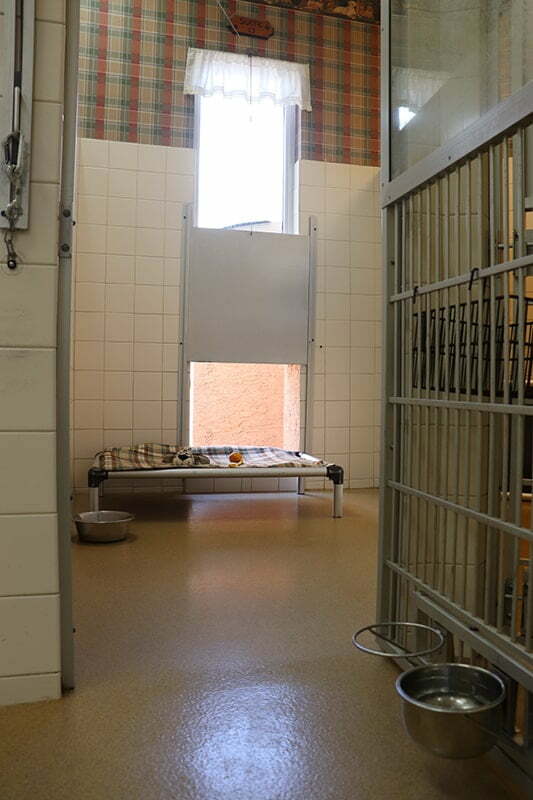 They are located in a very tranquil and serene area of the facility especially designed for their comfort. These suites are ample and very comfortable with a cozy and calm décor. Each suite has its own window and a private access to its own outdoor ample area. They are strategically located near the indoor play area to facilitate those guests with limited physical mobility without sacrificing their socialization and/or adequate playtime. The Cozy Country Suites are comfortable 7 X 5 suites tastefully decorated to provide a calm, home like feeling. These suites, separated by 7 feet tile walls, provide our guests with privacy and avoids stress. They each have a window and a door with access to a private outdoor area. Comfortable beds are available for each guest but you are most welcome to bring their favorite bed from home. 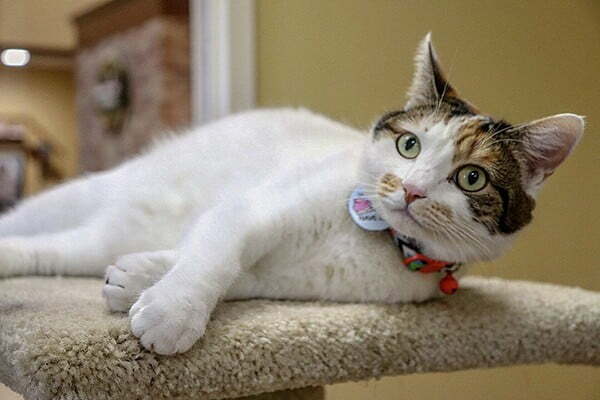 The Kitty Cabins are spacious, tranquil and very cozy. Our special kitty guests can rest and enjoy their leisure time observing the front gardens through their large bay window. Kitty guests also have their own private play area, where each guest is taken there various times a day to play, exercise and watch what is going on at the reception area.